Ongoing expansion of the metro grid – the Noida-Greater Noida, Majlis Park-Shiv Vihar, proposed Noida-Ghaziabad lines – is anticipated to have a significant bearing on the realty sentiment along the corridors. Approval of numerous road projects – Delhi-Meerut expressway, Delhi-Bareilly-Lucknow stretch, six-lane route to Dwarka Expressway – will uncover land parcels, resulting in new development. NCR reported an inventory pileup of over 1.5 lakh units, most of which remain incomplete. Experts, however, see virtue in the situation, claiming a significant volume of flats would keep price points buyer-friendly, thus boosting sales velocity in a couple of quarters. The State government authorised people to file self-declaration forms via recognised architect, mentioning that the building plans abide by the Haryana Building Code, 2017. If regulations are accurately followed, the government will issue OC within eight business days. Under the amended Unified Building Bye-laws, all construction firms, site engineers, contractors and architects would be responsible for structural defect of buildings for a decade post development. The modification went down well with homeowners of GK-I, Green Park, Vasant Vihar and Defence Colony. Land acquisition issue continues to stall the construction of Dwarka Expressway, leading to a paucity of basic infrastructure in almost 50 projects in Sectors 76-115, thereby, marring real estate sentiment. After a whirlpool of policy changes in 2016 and 2017, Delhi NCR welcomed 2018 on a hopeful note. A staggering inventory overhang, declining sales volume and Real Estate (Regulation and Development) Act (RERA) compliance issues were counter balanced by the governmental endeavour to boost connectivity. Delhi metro, currently the ninth largest rail system in the world, is set to become the fourth longest in 2018. This gigantic project holds the key to steer the property market out of the current impasse. Further, Centre’s bid to expand the ambit of Pradhan Mantri Awas Yojana (PMAY) is also likely to fuel demand by providing housing inventory priced within Rs 40 lakh. At present, Delhi NCR’s real estate market has all the ingredients for future growth. While RERA will drive transparency and accountability from the developer fraternity, Goods and Services Tax (GST) will preserve consumer interest in the ready-to-move segment. The focus on the construction of roadways and highways also augurs well for NCR’s real estate. The forthcoming quarter will witness developers continuing to scramble for RERA compliance, keeping a persistent check on new launches and unsold inventory. A few buyers might give up their watchful stance and take a leap of faith, boosting property sales by a small percentage. However, it might take over 3-4 quarters for any substantial change to become apparent in NCR. 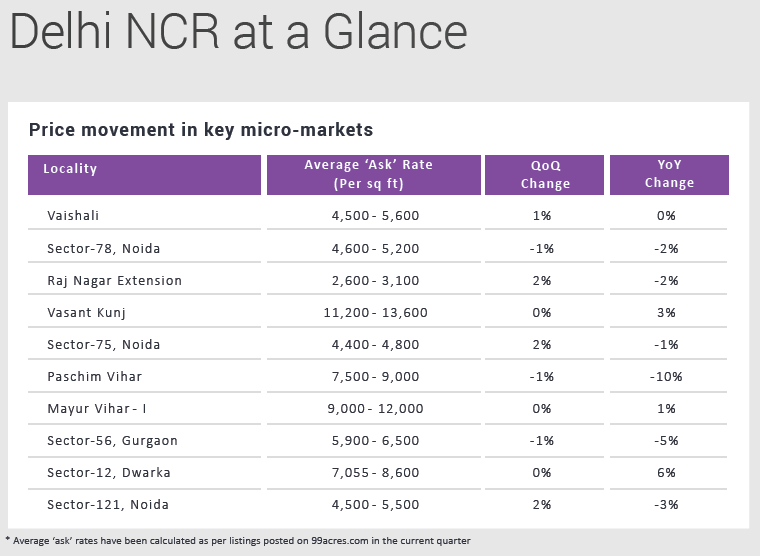 The micro markets of Noida and Greater Noida greeted 2018 on an optimistic note, marking a sharp contrast to the overall static realty landscape of Delhi NCR. ‘Ask’ values in both the capital and rental segments maintained status quo in Jan-Mar 2018. Even the huge inventory overhang could not dent market sentiment, instead worked in favour of the zone by keeping prices consumer-friendly. Development and expansion of connectivity projects helped several residential belts beat market blues and score an uptrend on the capital graph. Not surprisingly, Metro emerged as the primary growth catalyst, spurring property rates along the two upcoming corridors. Maintaining the growth spree of Oct-Dec 2017, Sector 150, Noida, emerged as the top grosser in Jan-Mar 2018. The three percent upturn in property price tags have resulted from the recent handover of delayed projects and the upcoming metro corridor. Sectors 79 and 143B in Noida and ZETA and Alpha-I in Greater Noida witnessed positive price movement on the back of metro expansion. The Aqua line corridor, set to link Noida City Centre to Sector Zeta, boosted homes values by 2-3 percent, QoQ. Sectors 50 and 75, Noida, boasted of a buoyant housing market, with prices scaling up by two percent, each, QoQ. While metro connectivity bolstered sentiment in Sector 75, home values in Sector 50 improved due to the commercial development happening in proximity and ambitious ‘asks’ by owner and broker community. Although Sectors 71 and 72 did not perform well on the capital charts in Jan-Mar 2018, the pockets are anticipated to witness growth in the forthcoming quarters. In addition to the metro proving a market mover, this lal dora land belt might also house Pradhan Mantri Awas Yojana (PMAY) projects, offering housing units starting Rs 30 lakh. Quite unexpectedly, Sector Chi V reported an appreciation of three percent in the capital prices, QoQ, and six percent in rental values, YoY, on the back of new and enhanced road infrastructure. Diverging from the capital story, the rental segment of Noida and Greater Noida delineated a gloomy ambience. Average weighted values either stagnated or declined in over 70 percent of the tracked localities in Jan-Mar 2018, versus the same quarter in 2017. Emerging from the shadows of slowdown, Sector 53 clocked a growth of seven percent in rentals, YoY, on the premise of new connectivity links. Similarly, Sectors 78 and 83 posted a surge of eight percent, each, owing to the presence of new ready homes, and popularity among students and single professionals. The residential property markets of Gurgaon and Faridabad remained muted in Jan-Mar 2018. Price points stagnated and new launches remained glaringly low in the Millennium City. The launch of a regulatory authority under RERA has the potential to extricate Gurgaon’s market out of the current impasse. Meanwhile, the impact of the recently framed Faridabad Development Plan–2031 is yet to be observed. Sectors 37D, 62 and 77 topped the popularity charts of Gurgaon in Jan-Mar 2018, with a four percent increase in capital values, QoQ. While the launch of a new tower in the developed pocket of Sector 77 propelled capital ‘asks’, construction of new roadways influenced price points in Sectors 37D and 62. The Millennium City also boasted of housing the Trump Tower. The ultra-luxury project spelled good news for Sector 65 along the Golf Course Extension Road, which posted an upswing of over three percent in property rates, QoQ. The first quarter of 2018 witnessed a number of connectivity projects, easing traffic and lifting realty sentiment in select residential pockets. Malibu Town was one such area, which benefitted from underpasses becoming operational in Rajiv Chowk and Signature Towers. The road projects reduced bottlenecks to a large extent, propelling prices by an average of four percent, QoQ. Sector 84, Gurgaon, too, reported a buoyant market on the back of new infrastructure pronouncements. A proposed road project by the Haryana government holds the promise of improving connectivity to Manesar, thereby, opening up new land parcels for development. Average rental ‘asks’ reported an incremental growth of two percent in Jan-Mar 2018, as compared to the same quarter in 2017. Nirvana Country took the lead, posting a massive surge of 12 percent, YoY, followed by DLF City Phase-V with a 10 percent growth. In keeping with the trend of the season, Nirvana Country and DLF City Phase-V owed its cheerful rental markets to the underpass connecting the housing hubs to NH-8. 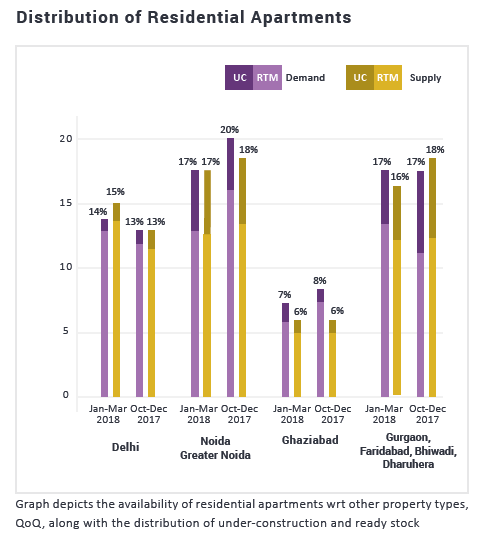 Faridabad’s property market remained rather gloomy with only 25 percent of the tracked localities reporting marginal uptrends on the capital charts. Sector 91 emerged as the frontrunner, clocking five percent growth, QoQ, owing to presence of comparatively affordable homes. Faridabad’s rental market remained upbeat, with average values increasing by four percent, in Jan-Mar 2018 vis-à-vis 2017. The growth resulted from the renewal of rental contracts. The Jan-Mar 2018 quarter was testimony to an increase in the number of property enquiries in Ghaziabad, owing to mega connectivity projects in the pipeline. Although residential sales volume and price points dropped marginally in the March ending quarter of 2018 vis-à-vis Oct-Dec 2017, market sentiment remained upbeat. The quasi-industrial city reposed all hopes of realty revival on improvement of civic amenities and connectivity to Delhi and Noida. Ahinsa Khand II outperformed other locales, reporting an average weighted capital growth of three percent in Jan-Mar 2018. The residential pocket rode the wave of Noida-Ghaziabad metro linkage. The recently-planned metro line connecting the two UP cities set most of the Indirapuram residential pockets abuzz. In addition to Ahinsa Khand II, locales such as Abhay Khand, Shakti Khand II and Niti Khand I, too, witnessed an appreciation in property price tags, QoQ, although by a small margin. Although property prices across Ahinsa Khand I, Nyay Khand I, Shakti Khand III and IV either stagnated or declined in Jan-Mar 2018, soothsayers predict a better future in the upcoming quarters. In what came as a surprise, the price points in Mohan Nagar and Vasundhara remained muted despite the announcement of a metro line connecting Vaishali with Mohan Nagar, while Vasundhara would be a transit point. Vaishali, however, recorded a minimal price rise. In addition to the seamless connectivity between Delhi, Noida, Meerut and Haridwar, handover of long-delayed projects gave an impetus to real estate sentiment in Raj Nagar Extension, propelling prices by two percent, QoQ. The upcoming Delhi-Ghaziabad stretch of NH-24, the Noida-Ghaziabad metro and the nearly-completed 14-laning of the road stretch between UP Gate and Dasna spells some hope of a realty revival. Ghaziabad’s rental market lent cheer to the city’s real estate, showcasing an upturn of three percent in Jan-Mar 2018, as compared to Jan-Mar 2017. Gyan Khand and Vasundhara emerged as the top performers with a whopping 14-15 percent annual growth. Despite the availability of new inventory, Crossings Republik’s rental market failed to see any growth. Paucity of civic amenities and inefficient connectivity to Ghaziabad and Greater Noida kept rental values under check. Stiff competition from Noida Extension w.r.t. to inventory and prices deterred rental demand in Crossings Republik. Shalimar Garden saw a surge of eight percent in rental ‘asks’ YoY, owing to the improvement in civic amenities and existing road infrastructure. The road repair work undertaken by the Ghaziabad Municipal Corporation is anticipated to bode well for the capital market, too. Although highway and metro expansion projects positioned Delhi’s realty landscape on a growth path, positive price movement continues to remain a conjecture in this saturated micro-market. The anticipated plot submission under land pooling policy in April, however, is anticipated to spur the real estate scenario of the capital, with the Delhi Development Authority (DDA) claiming to meet the residential needs of over 90 lakh people. Housing prices in Delhi remained under pressure in Jan-Mar 2018 vis-à-vis Oct-Dec 2017, notwithstanding the expanding metro network and completion of the Kundli-Manesar–Palwal (KMP) Expressway. Dwarka was the only micro-market to score capital growth in Jan-Mar 2018, albeit insignificant. While proximity to Gurgaon has always worked in its favour, the expected handover of 500-1,000 apartments in the next quarter kept the market upbeat. Property prices maintained status quo in North and South Delhi, but declined marginally in the east-west quadrants. The overall dullness might get dissipated soon with the land pooling policy opening up new parcels of land for the development of budget homes. Sector 16, Rohini, emerged as the bellwether of Delhi’s real estate capital market, clocking an appreciation of four percent, QoQ. This economically viable locality, where commercial absorption is on a rise, also stands to benefit from the expanding metro network. The buyer community’s zest for competitively-priced homes became apparent in Jan-Mar 2018 as residential belts housing inventory within Rs 20-30 lakh witnessed maximum traction. Khanpur, Uttam Nagar, Okhla and Mahavir Enclave reported property values surging by an average of 2-4 percent, QoQ. Jor Bagh and Gulmohar Park in South Delhi, which clocked a growth of four and two percent, respectively, emerged as exceptions. A detailed study of the two localities, however, reveal over ambitious ‘asks’ driving the price movement. Mirroring Noida-Greater Noida’s story, Delhi’s rental landscape dipped marginally in Jan-Mar 2018 versus the same quarter in 2017. While price correction is quoted as one of the reasons, the movement of the Central Business District (CBD) from Connaught Place to Noida and Gurgaon has also impacted the segment adversely. Ramesh Nagar in West Delhi held the baton of progressive rental charts, marking an upswing of eight percent, YoY. The locality was followed by Safdurjung, Sector 7 and 22 in Dwarka, which witnessed an incremental growth of seven percent, each. Improvement in civic amenities augured well for the city. Delhi NCR reported a marginal uptick in demand for possession-ready properties in all zones, save the Noida-Greater Noida belt. Although the twin cities reported consistent appetite for ready and under-construction homes, QoQ, residential pockets witnessing infrastructural development exhibited improving sentiment. Supply, however, remained restricted across zones, with the developer fraternity focussing on compliance with RERA and GST norms. Although demand for under-construction properties have reduced considerably in the wake of an effective 12 percent GST levied on the segment, Gurgaon- Faridabad residential belts reported a steady demand for projects nearing completion. The trend is anticipated to change as soon as Haryana sets up a regulatory body under RERA. Surprisingly, demand for properties in the affordable bracket (within Rs 40 lakh) reported a declining graph in Jan-Mar 2018 vis-à-vis the March-ending quarter in 2017, as availability in the bracket stagnated in the same period. Simultaneously, popularity of homes in the ultra-luxury budget category of Rs 2 crore and more delineated an uptrend. The growth can be attributed to the launch of a couple of luxury projects in Gurgaon, including the Trump Tower. A demand-supply equilibrium was observed only in the luxury and ultra-luxury brackets of Rs 1 crore and above. The rest of the categories continued displaying a mismatch.